"Mommy, I just want to snuggle with you." Most nights, I can't resist that one... I let him climb in bed next to me and we talk about his day, or we watch youtube clips of Ina or Giada cooking, or I check my Google Reader or whatever. He usually conks within a few minutes. This night, though, it was late, and I knew he needed to hit the sack. "Not tonight, buddy." I said. "We'll snuggle tomorrow." "Can I go down and say goodnight to Daddy?" Now, this had already been done--twice--but I said, "Sure. Go say goodnight to Daddy, but then come right back and get in bed." As I guessed would happen, he was gone for a little while. I figured that he was just pulling more stall tactics with Shane...but after about 10 minutes, he came back with an index card in his hand. Now, if you didn't know, my Colin is quite the artist. He loves anything he can create, paint, put together, cut, glue, form, or fashion. This night, however, he 'created' my favorite project to date. "Mom, look what I did with this alphabet card!" I grabbed the card and took a look. Awww! I thought. 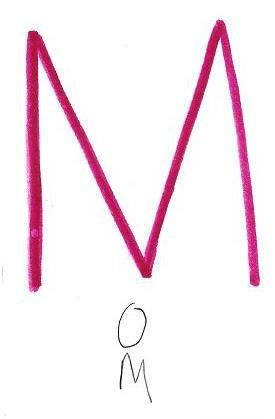 Look what he did with the "M" letter! He spelled out Mom. Such a smart little guy. 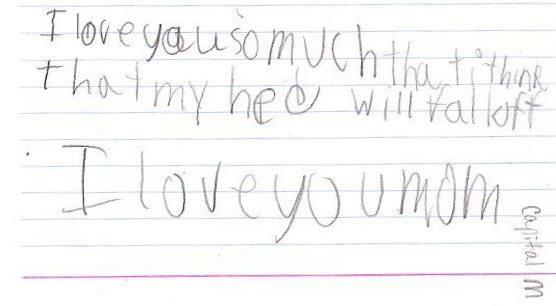 some more of those warm, fuzzy feelings only your littles can give you. "I love you so much that I think that my head will fall off. I love you Mom." ....in my bed he climbed. Way better than Tim's punishment paper about farting on the phone. You have to be a mom to understand how sweet that truly is. Makes my heart hurt. Love it. O my gosh! That is sooooo precious!